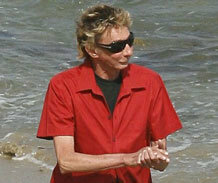 BARRY MANILOW UNDERGOING PLASTIC SURGERY TO BECOME RARE SEABIRD. Home → Damien Zone → BARRY MANILOW UNDERGOING PLASTIC SURGERY TO BECOME RARE SEABIRD. After several operations in which singer Barry Manilow is attempting to transform himself into a rare seabird, Manilow appeared on a beach in Dana Point, California to answer reporter’s questions. Barry Manilow has been enduring a harrowing series of plastic surgeries that he hopes will eventually turn him into a Leather-Vested Whooping Crane. Currently he is living as a sea gull until additional surgeries are complete. So if you see the man who writes the songs that make the whole world sing flying over the Pacific Coast Highway, be nice and throw him up a french fry. Fans had grown concerned recently about Manilow’s thin, bird-like appearance, and there were concerns about his health, but Barry is okay. “Soon I’ll be flying high,” chirped Manilow. ” I’ll be able to soar over Mailbu and maybe even eat some bread from Barbara Streisand’s back yard — that’s going to feel good. Of course I will still be able to visit my mother but she will have to put down newspapers. Doctor’s at the Audabon Hospital of Bird Transformation Studies are proud of their celebrity client. “We are proud that Mr. Manilow has chosen to transform himself into a seabird,” said the hospital’s chief bird transformation surgeon Dr. Naomi Wing. “Soon he’ll be flying high and shitting on some of the most expensive real estate in the United Sates. SURGERY COMPLETE: Barry Manilow is now a rare seabird. Awesome! It’s refreshing to see an artist of Manilow’s caliber and longevity not afraid to spread his wings. Yes, spread his wings — which is better then spreading his legs and lifting them up…..ugh, never mind.